Trainer Arnaud Delacour confirmed Wednesday that Lael Stable's Divining Rod is on course to run in the 140th Preakness Stakes on May 16. Delacour plans to send the son of Tapit out for his final work for the Preakness at 9 a.m. Saturday at Fair Hill Training Center in Elkton, Md. 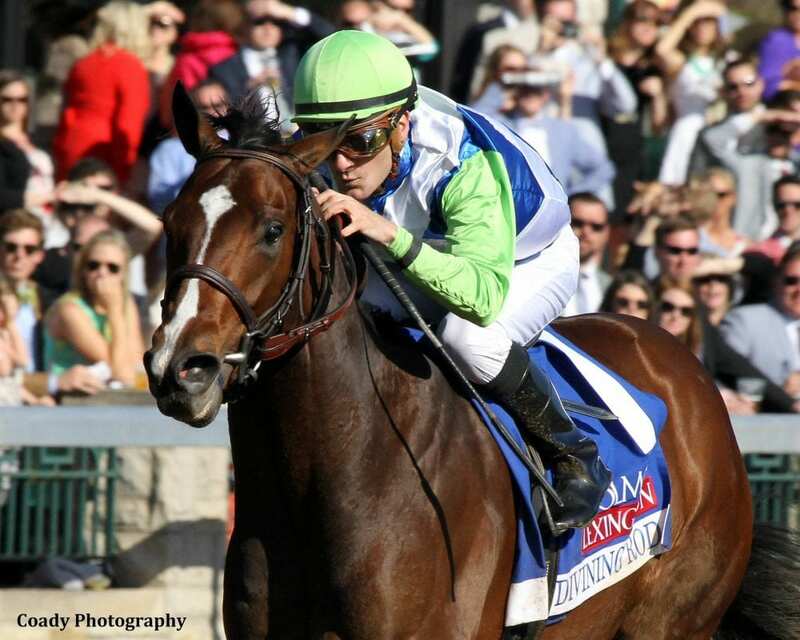 Divining Rod, winner of the Lexington Stakes (G3) at Keeneland on April 11, had 20 Kentucky Derby qualifying points and could have drawn into the field from the also-eligible list. However, Delacour and the colt's owners-breeders, Gretchen and Roy Jackson, decided not to enter the Derby and pointed for the Middle Jewel of the Triple Crown at Pimlico Race Course. “We weren't sure we had enough points,” Delacour said. “We were on the bubble, and it's very hard to train a horse to a race like the Derby not knowing if you're going to get in. That puts some pressure on. Also, we would have been coming back in three weeks after a good effort in the Lexington and shipping. We thought that maybe it was coming back a little bit too quick. And also, the Jackson saw statistics that showed horses that won the Lexington and came back in the Derby ran a little flat. Delacour watched favored American Pharoah catch and pass Firing Line and Dortmund to win the Derby by one length on Saturday. Divining Rod will be one of the so-called new shooters in the Preakness taking on Derby grads – led by the top three finishers – coming to Baltimore. American Pharoah prevailed in what was easily the most demanding test of his career. Meanwhile, Delacour feels that Divining Rod has flourished since returning to his home at Fair Hill. “I think he came back well,” Delacour said. “We gave him two easy weeks where we trained him lightly and let him get his level of energy back. That worked out great. He's had two breezes since – one easy breeze and last week was a more significant breeze. I was pleased with both, really. Trainer Todd Pletcher remained noncommittal about how many horses he might enter in the Preakness. Among those under consideration are Pat Day Mile winner Competitive Edge, Materiality, who was sixth in the Kentucky Derby, and Carpe Diem, who finished 10th at Churchill Downs. Stanford, most recently second in the Grade 2 Louisiana Derby, is also possible. This entry was posted in Triple Crown and tagged divining rod, Horse Racing, Maryland Jockey Club, pimlico, Preakness Stakes, thoroughbred, Triple Crown by Press Release. Bookmark the permalink.